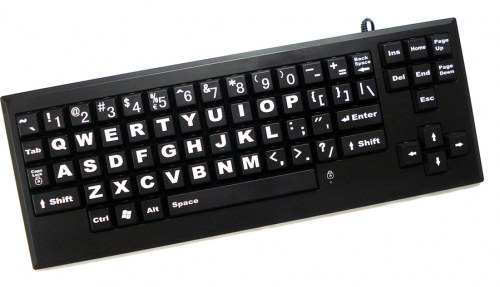 VisionBoard is a USB keyboard that provides 1-in/2.5-cm black keys and bold, contrasting white print. Function keys are included; VisionBoard is compatible with Windows 98SE and newer, and MAC OS 10.1.5 and newer. 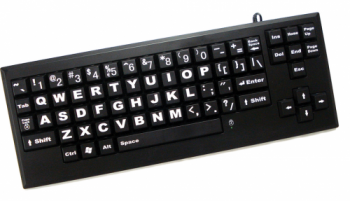 VisionBoard - Black is a large print keyboard offering an advantage to people who find it painful or difficult to use a traditional keyboard. Providing 1-in/2.5-cm black keys and bold, contrasting white print improves readability and reduces eyestrain. Large keys are great for people with low vision or dexterity issues and are useful in industrial and manufacturing sites. This keyboard is great for people with larger hands. VisionBoard does not have function keys; reduces clutter with simplified layout.